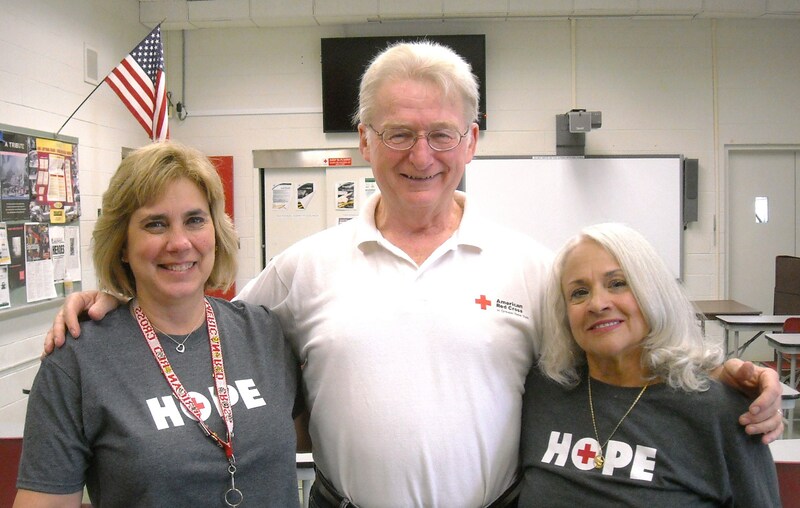 Long-time volunteers Nanci Banninger, Brian McMullan and Linda McMullan are members of the local Disaster Action Team (DAT) that serves as the ‘first-0n-the-scene’ Red Cross contact at the site of a disaster. The American Red Cross relies on volunteers to alleviate human suffering during emergencies, 24 hours a day and 365 days a year. Red Cross disaster crews that respond to thousands of disasters every year, such as home and apartment fires plus state-wide and/or national hurricanes, are comprised of over 90 percent volunteers. Long-time volunteers Linda McMullan, Brian McMullan and Nanci Banninger are members of the local Disaster Action Team (DAT) that serves as the ‘first-on-the -scene’ Red Cross contact at the site of a disaster. They help those people who have been displaced and start the recovery process. Emergency assistance may include temporary housing, food, clothing, basic household furnishings, help with healthcare needs and referrals to other agencies. During large disasters, these on-call DAT volunteers work in shelters and on mobile kitchens, conduct damage assessments and provide crisis intervention. In addition, they deliver snacks and drinks to emergency responders, including firefighters and police. Typically, many people are displaced from their homes during disasters such as tornadoes, hurricanes, wildfires and floods and may need accommodations for one night or one month. Red Cross shelters can serve hundreds of families at a time and may be located in a school, church or another facility. The DAT team sets up cots, feeding stations and provides services such as client casework plus emotional and physical care. If there is time to pack, those displaced may bring bedding, clothing, medications and blankets. The shelters provide a safe place to sleep; meals, snacks and water; health services including first aid; emotional support and mental health services; help reconnecting with loved ones and information about disaster-related resources in the community. When the displaced population returns home, the Red Cross helps with clean-up supplies, meal deliveries to areas that lack power and water plus a Case Worker to access funding for repair efforts. If the displaced citizens’ homes are not ready, then the Red Cross helps locate transitional housing and the shelters do not close until all of the citizens have a safe place to go. When disaster strikes, the DAT members climb into their Next Generation Emergency Response Vehicles (ERVs) and travel to the neighborhoods of those in need, providing food and water. Modular features allow the vehicle to quickly transform, so that the volunteers can serve thousands of meals a day or meet one-on-one with a family displaced by a home fire. The ergonomic design of its interior provides more room and greater comfort for volunteers who work for long hours inside the vehicle. Volunteers can sit on chairs in the ERV and distribute food and water or interview displaced families. The interior workspace of the vehicle can easily be converted from meal service to cargo hauling to case work, resulting in a flexible response to a disaster. The ERV features a cluster of the latest electronic equipment like GPS, backup camera, two-way radio, backup alarm system and USB ports to charge cell phones. The American Red Cross Pillowcase Project, sponsored by Disney, is an interactive preparedness program designed for youth ages 8 to 11. The activity aims to increase awareness and understanding of natural hazards and teaches safety, emotional coping skills and personal preparedness. Through instructor-led presentations, students learn the best ways to stay safe during a home fire and how to create their own emergency supply kits by packing essential items into a pillowcase for easy transport during a disaster. The pillowcase may contain small bottles of water, granola bars, dried fruit, a blanket, first aid kit, flashlight and extra batteries. Students also have the opportunity to decorate and personalize their pillowcases. March was first proclaimed as National Red Cross Month in 1943 by President Franklin D. Roosevelt as a way to raise awareness of the organization and its humanitarian mission in the midst of war. Since then, every President has designated March as Red Cross Month. The American Red Cross is synonymous with helping people and has been doing so for more than 130 years. For additional information about volunteering call 1-800-733-2767 or visit www.redcross.org.